Happy holidays! Check out the snow on our blog! Categories: Other Projects | Tags: climate change, december, environment, environmental awareness, global warming, green, green club, holidays, Madison, Madison West Green Club, snow, warm weather, weather, West High School, Wisconsin | Permalink. We had a Green Club meeting after a string of no school days. It felt great to get back to business! We took a break from project planning to work with our local branch of Citizens Climate Lobby, an organization dedicated to promoting legislation on environmentalism, by motivating our legislators to act on climate change. We wrote a total of eleven letters to our newly elected Senator Tammy Baldwin, encouraging her to make legislation on climate change one of her top priorities. Mr. Grady discussed the proposed carbon tax, and many members asked Tammy to consider its implementation and help generate publicity on it. We also wrote about what global warming means to us personally and why we care, and we learned about how climate change has affected our local area. 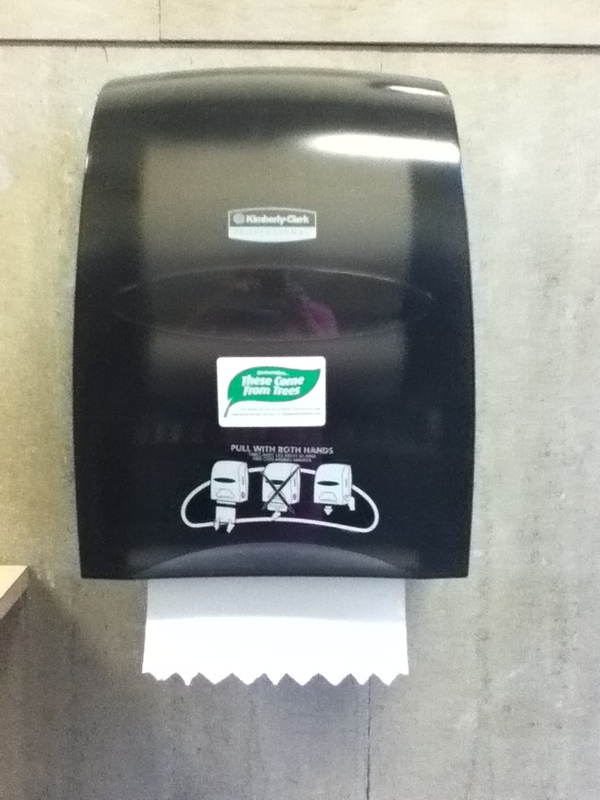 Meanwhile, some of our club members worked on procuring “Remember…These Come from Trees” stickers for the new paper towel dispensers West High School implemented. (Thanks, Eli, for taking the initiative!) Green Club hopes to fundraise enough to get hand dryers for the school, a green alternative to using paper products. More updates to come on this project! “These Come from Trees” stickers on paper towel dispensers at West High School. Categories: Other Projects | Tags: carbon tax, Citizens Climate Lobby, climate change, environmentalism, global warming, green, legislation, letters, Madison, Madison West Green Club, Tammy Baldwin, West High School, Wisconsin | Permalink. Brief Announcement: Our group today was exceptionally small. Weekly attendance is becoming a pretty big issue. If we want to accomplish things as a group, people really need to show up and do their part! 2) We determined the bins that we are going to buy for our LMC recycling project and wrote a grant proposal to obtain the money to purchase the bins. You can check our the bins by clicking on this. Our recycling center will have components for cell phone recycling, ink cartridge recycling, battery recycling, plastic bag recycling, pencil/pen recycling, and an undecided last one. Please comment, post an idea on our Facebook group, or send us an email with ideas! On a more reflective note, I just wanted to share some knowledge that I learned today. My biology class is currently studying animal behavior – especially in primates. We had the opportunity of going to the Henry Vilas Zoo today and observed the orangutans and chimpanzees enter their exhibits immediately after the zoo keeper had set up their enrichment. We also had a really interesting question and answer session with the zoo keeper. While observing the chimpanzees (there were three in the exhibit), two were looking especially depressed and exhibiting “stereotypic behaviors,” such as rocking back & forth and sucking a finger. Stereotypic behaviors generally mean that the animal isn’t doing well psychologically. We asked the zoo keeper about it, and she told us that the chimps had been kept as pets when they were younger. Instead of learning how to be chimps, they learned how to be humans. After being rescued and put in a proper “chimp”environment, they became very unhappy and depressed, because they felt they belonged on the other side of the glass. The zoo keeper told us not to purchase items with baby chimp/orangutan/monkey pictures, because these animal models have generally had an earlier life as a pet. After they mature and lose their cuteness (around age eight), they are abandoned and mistreated – and often picked up by zoos. After all, these organisms have a life span of around 50 years in captivity. Even though a zoo will care for the animal, it’ll live for another 42 years. In misery. Categories: Other Projects | Tags: battery recycling, cell phone recycling, grant, ink cartridge recycling, pencil/pen recycling, plastic bag recycling, recycling, Terracycle | Permalink.